BE projects / paper presentation : Embedded systems, in military applications ~ Engineering projects ideas for final year students & paper presentations collection blog. This is an projects / paper presentation on the mentioned topics which fall under the category embedded system in military and defense applications. this was collected and presented by our HE team in reply for the request from our reader. This post consist of a be project for electronics and communication engineering. The mentioned paper presentation is an patent paper, which is to be used for educational purposes only. This project is highly technical and only for engineers with the guidance of their staff. Projects level is expert and this can be very well used for paper presentation competitions for electronics engineering students. 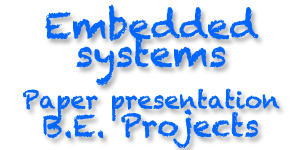 There are other basic embedded system papers and seminars for students who are looking for simpler and basic concepts.